Irish rebels against British rule established a government at Kilkenny on October 20 1642, 371 years ago this week. An account of how Ireland’s first national Assembly came about. 1. Thirty years earlier, large areas of land in Ulster were given to English and Scottish people. This was known as ‘The Plantation of Ulster.’ The land had been owned by native Irish people before that. 2. Only a small group of native Irish landowners held onto their land after the plantation. A bitter feeling towards the new settlers lingered from this time. 3. There were bad harvests in Ulster since the late 1630s. Many of the landowners were in debt. 4. Some of the leaders, such as Phelim O’Neill and Philip O’Reilly were members of parliament in Dublin. They had witnessed how the parliament in England had over-ruled many of their suggestions for change in Ireland. 5. The English parliament was anti-Catholic and was becoming very powerful. It was even challenging King Charles I. 6. Other native Irish leaders had worked abroad as soldiers and came home to Ulster in 1640 when the royal army was looking for new recruits to fight in Scotland. As it happened, most of the soldiers didn’t leave Ulster and this meant that men with experience were available to take part in the Rising. It would seem that their plan was to move quickly and take over the key positions in Ulster and negotiate a peace deal with the King - the rebels always claimed to be faithful to the King, but not to the laws of parliament. By the end of November the rebels had moved down as far as Drogheda in County Louth. But unlike the speedy war planned, the fighting continued for years. When the Members of Parliament in Dublin found out about the Rising, they became very alarmed. Not alone was the unrest happening in Ulster, but other areas of Ireland as well. The Lords Justices responded by declaring that Irish Catholics were evil and disloyal to the King. Catholics in parliament were very insulted by this. Some of these men were from native Irish families; others belonged to a group known as ‘The Old English.’ Their families came over from England in the 12th Century and had remained loyal to the King or Queen of England. Nearly all of the ‘Old English’ remained Catholic. Some of the MPs for Kilkenny belonged to this group. In the 1640 Parliament, Peter Butler, Henry Archer, Peter Rothe and Edward Comerford were all Catholics. The Earl of Ormonde, James Butler - of Kilkenny Castle - was also ‘Old English’ but he had converted to the Protestant faith as a child in England. He was appointed acting supreme commander of the Royal Army in Ireland. 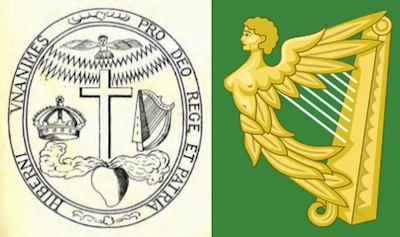 The Old English Catholics asked the Irish parliament -- where there was a majority of Protestant members - to provide them with guns and ammunition to fight the rebels. They also offered to meet the rebels to discuss their grievances. The Parliament wouldn’t agree to take any action. This worried the Old English M.P.s -- were they not to be trusted? They had seen a number of changes in parliament over the last few years and had become more anxious themselves about the way Catholics were being treated. Rules for elections had been changed during the 1630s and this meant that the number of Catholics in the 1640 Irish parliament was down one-third since the parliament of 1634. Like the native Ulster Irish, they were keeping an eye on what was happening in the English parliament. Apart from the anti-Catholic outlook, the way in which the English parliament had reduced the power of the King was very worrying, as it was to the King this group looked for protection. The time seemed ripe for the Old English to meet the leaders of the Rising. Two meetings with the leaders were arranged, the second one on the ancient Hill of Tara. From this point onwards, the Old English and the Ulster Irish were fighting on the same side. By December 1641, the rebels had taken over Kilkenny City. The local leader was Richard Butler, or Viscount Mountgarret. He was a great-uncle of the Earl of Ormonde. He tried to keep the rebels from murdering the local Protestants or ‘English’ as they were known. However, Protestants were attacked and their houses looted in the city and throughout the county. There were similar scenes taking place in other areas of Ireland. Owen Roe O’Neill was a professional soldier. He left Ireland as a young boy in the ‘Flight of the Earls.’ He served for forty years in the Irish Regiment of the Spanish Army and returned to Ulster in 1642 to take part in the Rising. The first assembly was held on 24th October 1642. Between that date and 1650, eight more assemblies were held in Kilkenny. Robert Shee’s house, which stood where the road goes from Parliament Street down to The Market Yard car park, had thirty-five rooms and it was here that the assembly met. The fact that James Butler, Earl of Ormonde, was on the side fighting against the Confederates made the situation in Kilkenny very strange. He had to remain in Dublin. His wife stayed in Kilkenny Castle for a while, but when she left, Viscount Mountgarret moved in. James was related to many of the Confederates. Apart from Mountgarret, his brother-in- law Viscount Muskerry was also an assembly member, not to mention several Butler cousins. Even though the Assembly clearly stated that it wasn’t a parliament, it performed many of the functions of parliament such as organising its own army, sending ambassadors abroad, minting its own coinage and starting up its own printing press to publish pamphlets and leaflets. One of the most famous visitors to Kilkenny during this time was Archbishop Rinuccini, who came as a representative of the Pope. It continued until January 1649 when a peace settlement was made between King Charles and the Confederates. However, later that same month, the King was executed by the parliamentarians. Ormonde escaped to France with the king’s family. By August 1649, Oliver Cromwell had arrived to begin his bloody conquest of Ireland, in which hundreds of thousands would die.